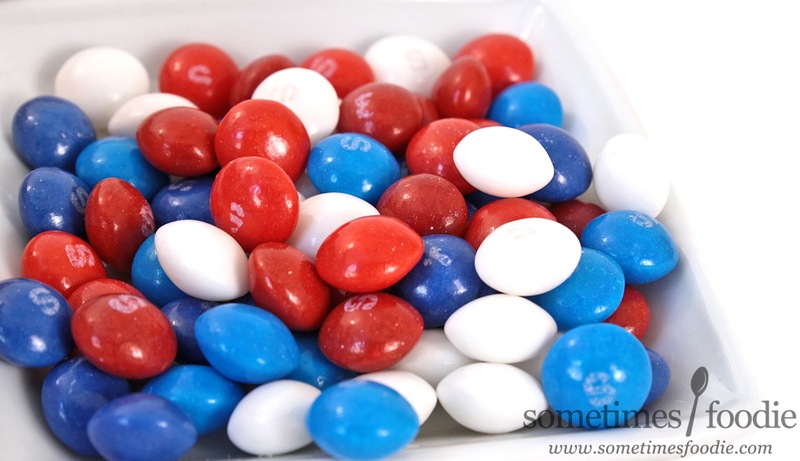 Apparently Memorial Day/Fourth of July themed candies are a thing and for some reason all of the candy companies are releasing theirs super early. 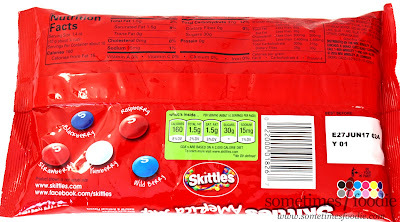 So...America Mix Skittles. That's a thing. Part of me wants to make fun of it, because it's America-themed Skittles, but as cheesy as it is, it's nice to see Skittles doing something new, and let's face it, it's a good marketing move. With the upcoming election and national holidays these are going to sell like hot cakes! Let's get this review started! Taste the patriotism! Check out this bag! It's easy for themed products to look cheesy and forced, especially when they're trying to be patriotic, but this flag-inspired design is quite nice! The flowing stripes at the bottom are sleek and stylish, and the top potion of the bag features a patch of dark blue with light blue stars. It's reminiscent of our flag without being overly obvious or obnoxious, and the design manages to incorporate Skittles' signature rainbow flawlessly. With all these colors this product had the potential to look incredibly cheesy, but it doesn't. Whoever is doing the designs over at Skittles really knows their stuff! NEW Blackberry (dark blue) - This one starts out with a deeper, jam-like berry flavoring but it quickly gets more artificial as you chew and ends up being a weird mix between raspberry and black currant. I don't mind eating this one, but I don't purposefully seek it out. I could have sworn we had a blackberry Skittle before, but I think I was confusing it with "Darkberry" from the Darkside Mix. Raspberry (dark red) - This one has a delightful sherbet-like raspberry flavoring that reminds me of Red Vines. Not bad at all, but this flavor is another repeat from the Wildberry Mix. NEW(?) Wildberry (bright blue) - Generically berry-like, but pleasant. I can taste hints of raspberry and maybe cherry? Also, I think this one might be a new flavor. I know the Wildberry mix had a blue Skittle in it, but it was raspberry flavored, not "Wildberry." This one is another one I don't purposefully seek out, but I really love the color. NEW Yumberry (white) - ...Really? Yumberry? Why isn't this lemon? Or lime? Or both? That way you could mix and match a few flavors in this mix to create your own bomb-pop flavor! Then it'd be double 'Merica! Such a missed opportunity! Anyway, this white Skittle tastes good...but I have no idea what a "yumberry" is. At first it started out kind of grapefruit-y, but then it starts tasting tropical, kind of like lychee. I like what this flavor brings to the table, and to be honest, it's my second favorite right after the classic strawberry. Three of these flavors (raspberry, wildberry and blackberry) have the same generic raspberry-note so when you eat them one after another, or mixed and matched, the flavoring gets boring very quickly. I found myself getting tired of the strong berry flavoring after just two servings and I started picking the Yumberry and Strawberry ones out of the mix. Which is a pity. If I could make any suggestions it would be to make the Yumberry flavoring the bright blue color, ditch the Wildberry flavoring all together, and replace it with a white lemon lime Skittle. That way you have something bright and different to break up the other berry flavors, and you can then market this is a Bomb Pop mix. How awesome would that be? Individually, these aren't bad flavors, they're just too similar to work together. Unless the flavor line-up is changed in the future, I wouldn't buy these again. It's just too raspberry-heavy for me, although I do hope Yumberry (as silly as it's name is) sticks around. Interesting! 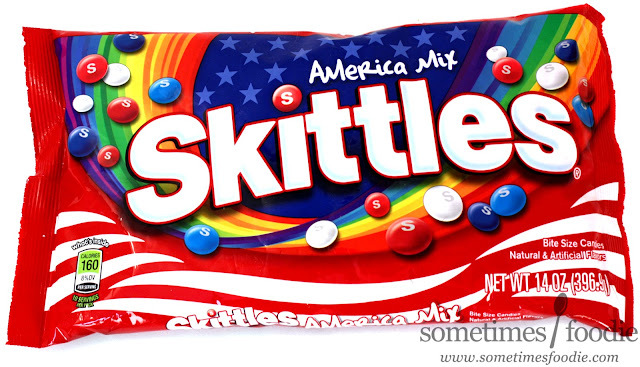 Since this is an "America" Mix I doubt Skittles meant to include a popular Chinese flavor, at least not on purpose. I'm guessing they made this flavoring up, since actual Yum berries are red, but who knows. Maybe they knew what they were doing all along! Latin name? Myrica. Awfully similar to 'murica! I found a green skittle in my bag.